Farmers’ markets can indeed be a great place to buy fresh vegetables and fruits, particularly if you don’t have a green thumb yourself, or you live in an area in which it is difficult to plant a garden. A great place, that is, unless your tax dollars are being used to support the local food movement. As the number of farmers’ markets has increased, so has the funding for food assistance programs available to farmers’ market shoppers. In 2010, participants in the Supplemental Nutrition Assistance Program (SNAP), commonly known as “food stamps,” redeemed more than $7.4 million in benefits at farmers’ markets, more than a 70% increase in one year. In the same year, over two million individuals redeemed Women Infant Children (WIC) coupons at farmers’ markets, and nearly one million seniors redeemed coupons through the Senior Farmers Market Nutrition Program (FMNP). Now, in 2012, the government is making it even easier for farmers’ markets to accept food stamps. The USDA has given $4 million in grants for states to install wireless technology at farmers’ markets to allow Electronic Benefits Transfer (EBT) card usage to purchase produce. I have no problem with people who truly need food assistance to be able to purchase produce with food stamps. But why all the pushing and urging of food stamps at farmers’ markets? Perhaps the USDA would like to further cement the presence of the food stamp program in the Farm Bill, whose fate will be taken up once Congress returns to work. The hope could be that linking farmers’ incomes further to food stamps will make it more difficult to separate the food stamp program, which comprises about 80% of the Farm Bill, from the agricultural subsidy program. The first problem with this effort is that the government is once again urging certain choices, using taxpayer funds to drive the purchase of food at farmers’ markets, and especially those located in urban areas, over that in other markets. Secondly, let’s not forget that the primary reason why food stamp usage has risen 100% under President Obama, to an annual cost of nearly $80 billion, is that unemployment is still well over 8%. This state of affairs is a bad thing. Yet, reading about the increase of food stamp usage at farmers’ markets at the USDA website could easily lead one to believe that Americans should be excited about the high rate of food stamp usage at farmers’ markets. Reality, however, has reared its head in the land of the local food movement. Yes, the fly in the farmers’ market ointment is, indeed, the free market. The supply of markets has far exceeded the demand, leaving more farmers with a glut of markets and not enough customers- food stamp users or otherwise- to make the markets profitable. Consequently, many farmers must add new markets to their schedules, increasing hours away from their farms or spending money to hire new employees. Many farmers I know personally have given up on farmers’ markets. Some markets require them to accept food stamps, necessitating time spent in training by their state Department of Agriculture (DOAG). Others have found that, with a little more advertising, and entrepreneurial spirit, they earn just as much at their own farmstands as they do at markets, without the hassle of lugging all their produce around or hiring someone else to work the market for them. Some particularly left-leaning communities have even turned farmers’ markets into “community organizing” hubs. Amid the colorful baskets of tomatoes and red peppers are tables touting Michelle Obama’s “Let’s Move” campaign, the MyPlate government nutritional program, green energy systems, and petitions supporting ObamaCare. The free market may take care of the glut of farmers’ markets. Conservative agricultural policy experts, however, have argued that the current Farm Bill must be split up between its food stamp and farm subsidy components. 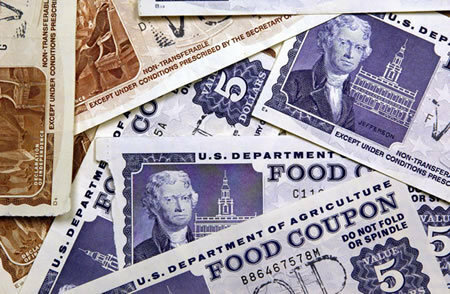 Ideally, the food stamp program must be reduced and audited for waste, and will be reduced once we elect a new president who will get government out of the way so that jobs can flourish again and far less Americans will have the need to be on food stamps. As for the agricultural subsidy component of the Farm Bill, farmers could be relying on private industry for crop insurance so that we can finally rid our bloated federal government of the weight of subsidizing another industry.